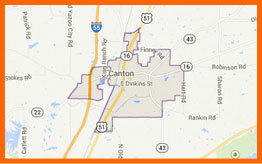 Welcome to Canton Municipal Utilities! surrounding area with the best possible service at the lowest possible rates. Our aim is to make doing business with us an enjoyable and rewarding experience. Our employees are aware that service to our customers is the most important concern and we always strive to provide that service with courtesy and efficiency. CMU employees are constantly undergoing training and attending classes and seminars to keep current with ever increasing certification and license requirements and technological advances. CMU crews are on call 24 hours per day, seven days a week to handle emergencies and related customer needs. Service maps and rates are provided for each type of utility. Just point and click at the designated spot. CMU’s electric department has proudly served residential, commercial, and industrial customers within the city limits of Canton since 1895. The system is operated and maintained by CMU personnel with a goal of providing reliable service at reasonable rates. CMU’s gas department is well trained in installing gas services, repairing leaks, installing main gas lines, and running leakage surveys on the gas system. Canton Municipal Utilities gas department has safely served residential, commercial, and industrial customers of the city of Canton and surrounding areas since 1936. The CMU water department is charged with maintaining and making necessary improvements to the water system and insuring that the water remains pure and meets rigid environmental regulations. Canton Municipal Utilities built its first water standpipe in 1896. CMU’s wastewater department is responsible for the proper collection of all wastewater through the CMU system. Wastewater is treated to meet environmental standards through a system of lagoons and a state-of-the-art treatment plant at Beatties Bluff. CMU has engineers and experts to assist and answer questions concerning utility services to home, business or industry. They are available to review construction plans and documents at your convenience. CMU requires all new services to be built to certain codes and specifications. Please feel free to set up an appointment with CMU concerning your project.